Julie Bayl’s mother-in-law Marlene gave her accounts of how she and her husband Ben utilized all their skills and the little resources they have to keep their family safe and alive during the occupation of Holland in World War II. 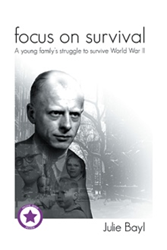 This account intrigued Bayl and inspired her to write “Focus on Survival: A young family’s struggle to survive World War II” (published by Xlibris AU in March of 2015), a tale of love and hate, war and peace, pain and joy, fear and exhilaration. Set for a new marketing campaign, the book is a historical account of the day to day deprivation, starvation and fear that stirringly conveys the indomitable courage of two typical Dutch citizens in wartime. Based on a true story of survival and intrigue commencing before World War II, the story leads readers into the fast-moving changes brought by the Nazi occupation of Holland. “I want readers to take away from my writing the lesson that determination and logical forethought can help us triumph during the trying times. It is about the need for them to think outside of the box. It is a heartwarming story about ordinary people doing extraordinary things” Bayl adds.